The other day I shared this video on Facebook. The video is by a friend of mine, Richard Johnson, who runs a website called Guns, Holsters and Gear. He reviewed the Steyr S9-A1, which is my concealed carry semi-auto of choice. In the Facebook comments, a fellow named Andy wanted to know about my gun. He asked if I’d ever blogged about my choice of the Steyr pistol; I checked my archives, and though I’ve mentioned it from time to time I never explained why I picked a decidedly non-mainstream gun to protect myself. It was 1998 and I was looking for a new carry pistol. While I’m known for my work with the double action revolver, I’ve always had both revolvers and pistols for self defense. While I had a couple of regular carry revolvers at the time, I was still looking for a pistol I really liked. My biggest issue was getting a pistol which fit me. I have small hands for an adult male; I have to wear a size small glove, for instance. My small hands made it difficult to find something I could easily operate. I’d also decided I didn’t want a gun with a manual safety (which is another story), so my CZ- and 1911-pattern guns had been relegated to competition only. The leading candidate for my new carry pistol was the gun my wife carried, a Gen2 Glock 19. I wasn’t wild about it, largely because it didn’t really fit my hands all that well. It was (and still is) a difficult gun for me to shoot. In the meantime, Massad Ayoob had written review of the then-new Steyr M9 for one of the gun magazines. He liked it, and my wife (who knows him) decided she wanted one too. Down to the gun store we went, only to find they didn’t have the M9 but did have its compact brother, the S9. It came home with us. Over many months both of us shot the Steyr and the Glock. My wife eventually decided she preferred the Glock, but I — with my smaller hands — preferred the better-fitting Steyr. It became “mine”. 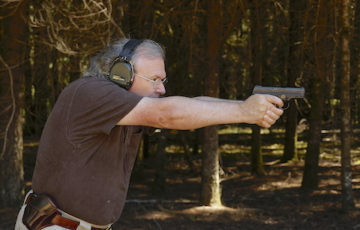 Me shooting the original Steyr S9 that I stole from my wife. I carried that S9 until a few years ago, when Steyr introduced the updated A1 model. The new model retained the best aspects of the original S9, but there were improvements in the grip contour which slightly reduced the trigger reach, along with a much larger magazine release. In my hands, where the original S9 was good the new S9-A1 was great. Here’s why I like the Steyr S9-A1 so much. First and foremost, the gun fits my hands. I can easily reach the trigger (which was tough with the Glock 19) and, most surprisingly, I can also reach the magazine release. With most pistols I have to work my hand around the gun, sometimes as much as halfway around, before I can push the release. With the elongated magazine release on the Steyr, just a slight shift allows me to reliably drop the magazine. Very few guns fit me as well as the S9-A1 does. The newer guns with interchangeable backstraps — most notably the Smith & Wesson M&P line — weren’t available when we bought that first Steyr, and although they are just a touch better with regard to trigger reach, none of them are as good as the Steyr when it comes to reaching the other controls. What about those crazy sights? 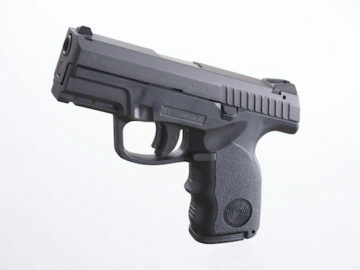 The Steyr pistols are probably best known for their trapezoidal sighting system. The front is a huge triangle, and the back is a hollowed-out triangle with the top cut off. In use, the front triangle is simply put inside the rear triangle. When I first tried the sights I had a little trouble with them; I’ve found most people who are used to “post and notch” sights have a similar initial difficulty. It didn’t take me long to adapt, however, and I found not over-thinking the sights was the key to using them. The design works well with the human visual systems and alignment happens almost imperceptibly if you simply let it. What’s more, the sights work extremely well for people with glasses (like me). If you can’t focus on your front sight without using the bifocal portion of your glasses, the Steyr sights are made for you. You can keep your focus on the target and the sights naturally align even when they’re blurry. What’s more, the sharp point of the triangle gives you a precise reference for where the bullet will hit and is easily discerned even when out of focus. The result is when I need to use the sights, I can get superb precision even though I can’t see them all that well. They work so well that I’ve often thought of machining a set for my revolvers! To me, the sights alone are a major reason to look at the Steyr pistols. While much is made these days about bore axis and its contribution to perceived recoil, the Steyr S9-A1 has one of the lowest slide profiles I’ve seen. It’s very much like the HK P7, in that the sights seem to sit right on top of your hand. Whether it’s that, the unlock timing of the barrel, the recoil springs, or something else entirely, it’s one of the softest-shooting 9mm pistols I’ve ever fired. One of the areas in which the A1 model improved over the original is in the quality of the trigger. The first ones were a bit heavy and gritty, but the A1 model is smooth, with a short take-up and a clean break. I’ve run into very few striker-fired guns whose triggers were as good, and fewer still which were any better. Unlike some of their competitors, aftermarket trigger parts aren’t needed. Steyr is renowned for the quality of their firearms and the S9-A1 is no exception. It’s well made; fit and finish is a notch above what you’ll find from that “other” Austrian pistol maker. The design even shows a lot of thought given toward longevity. Those of you who own Glocks and have experienced the slide falling off the frame due to a broken slide lock spring will appreciate the solid steel rotating take-down lever of the Steyr. That take-down lever is kept from accidentally rotating by a spring-loaded plunger which must be depressed to unlock the lever. It won’t release the slide accidentally. Remember I have two of the guns and have shot them extensively over long period of time. I can recall only one malfunction in 15 years, and it was a failure to feed on the first round in a magazine. A tap-rack solved the issue and it has not occurred since. (I assume I simply didn’t seat the magazine fully.) I have several friends, instructors and experienced shooters themselves, who report similar reliability with their Steyrs. My original S9 was carried in holsters my wife made for me (she had a holster business at one time.) When the S9-A1 arrived, I opted for a kydex holster, the Nano from Blade-Tech. Although a late convert to plastic holsters, I like it for its consistency and durability. My carry gun is currently loaded with the superb Federal 147gn HST, which shoots precisely to point of aim from the A1. One of the things I like most about Steyr is their commitment to their customers. I’ve gotten to know most of the staff at their U.S. headquarters, but before I did I was just a regular customer to them. When you call them they go out of their way to help you, which is very different from other manufacturers. The customer isn’t just a number to the Steyr folks, and I’ve seen evidence of their service. As the Vice-President of Steyr Austria told me, they really do consider their customers part of the Steyr family. It sounds schmaltzy — especially with an Austrian accent — but that’s how they treat you. Personally, I like that and I like to reward companies who do business that way. I’ve worked with Steyr on several projects over the last couple of years, including a long-term loan of a Steyr AUG rifle (which I’ll be using as a student in a class this July!) I’m not an employee, but I have a working relationship with them and they’ve supported some of my work. Here’s the important thing: they didn’t come looking for me. I went looking for them, precisely because at the time I’d been using their pistols for more than a decade and knew the guns to be of high quality. As I’ve said many times, I don’t endorse anything I don’t spend my own hard-earned money on — and I spent mine on the original S9 and the S9-A1 before I ever met a Steyr employee face-to-face. I endorse them not because they asked me to, but because I believe in their products enough to trust them to protect my life. And I have, for a decade-and-a-half. So, Andy, that’s why when I carry a semiautomatic pistol, it’s a Steyr. I don’t see that changing for a very long time. Hey Buddy!, I found this information for you: "What I carry: the Steyr S9-A1". Here is the website link: http://www.grantcunningham.com/2017/05/carry-steyr-s9-a1/. Thank you.